Reading the Fantastic Four comics from the start. The FF have split up and gone their separate ways, so in issue #394 we’re catching up with old friends and fighting a supernatural dinosaur man, like you do. 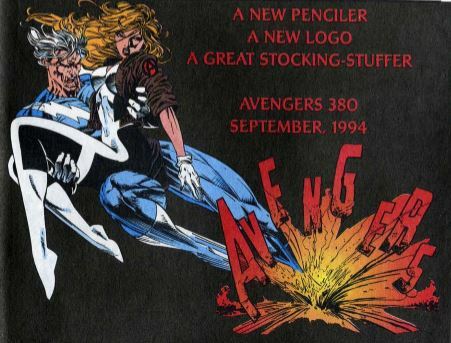 Gimmie a gimmick: This issue originally shipped to stores polybagged (wrapped in plastic) containing a 16-page minicomic promoting the Marvel Action Hour Saturday morning cartoon. The ‘toon featured Iron Man and our very own Fantastic Four. Somehow, Biker Mice From Mars first debuted as part of this cartoon, but they’re not in the minicomic. 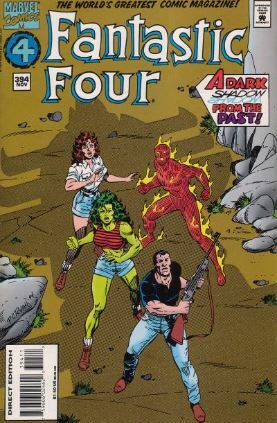 Issue #394 a variation on the classic “the characters show off their powers for a few pages” thing with Wyatt Wingfoot riding his cool motorcycle through an obstacle of Johnny shooting fire at him and She-Hulk throwing boulders at them both. As noted in my recent Fantastic Force write-up, She-Hulk’s solo series had recently ended with her working for Millie the Model (!) and acting in a soap opera (!). These issues find her back practicing law while also reconnecting with her old Fantastic Four pals. Also, she and Wyatt split up in the miniseries She-Hulk: Ceremony, but they’re still good friends. Everybody’s out in the “Great Western Desert” where Johnny and feisty coed Bridget O’Neil and some ESU students are helping Wyatt’s tribe on an archeological dig. 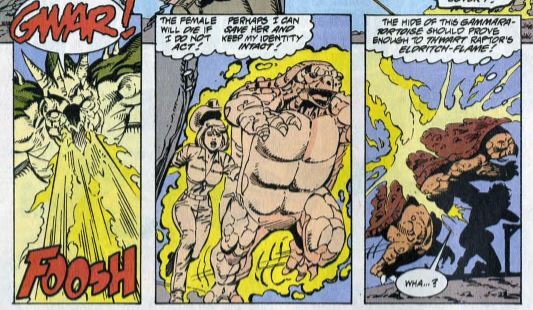 Also working the archeology dig is the mysterious blonde woman from the previous issue, who is secretly Lyja the Skrull spying on Johnny. In New York, Alicia shows up at the Baxter Building asking to see Ben, only for Roberta the robot receptionist tell her that Ben asked not be disturbed. Alicia leaves, angry. Ant-Man confronts Ben about this, and Ben says it’s time that he and Alicia both got on with their lives. He also admits he’s been dwelling lately on how Wolverine slashed up his face back in issue #374. This also foreshadows next issue. At the dig site, local cop Officer Chavis mediates the dispute between Stalking Fox and students, while archeology professor Simon Janson secretly reassembles all the pieces of the totem, saying it’s his “important work.” He accidentally (or not?) cuts his finger and spills a drop of blood on the totem, which of course causes dark magic to stir. The totem zaps Janson with an energy beam, transforming him into Raptor the Renegade, a half-man half-pterodactyl. While flying around and terrorizing the students’ camp, Raptor takes time to explain his origin. He and his fellow dinosaur-men once ruled the Earth, only for primitive men to trap him in a totem and bury him, so that humanity could be free of his evil and whatnot. 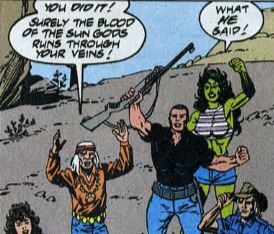 Bridget gets on the radio and contacts Johnny, who is out in the desert with Wyatt and She-Hulk. Lyja transforms into a dinosaur herself to protect Bridget from being harmed. Johnny and She-Hulk fight Raptor, with nothing they harming him. 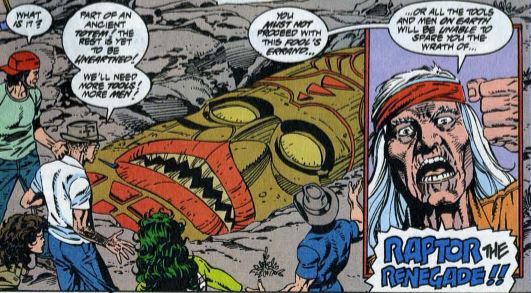 Meanwhile, Wyatt deduces that the totem is the source of Raptor’s powers. Raptor boasts that only a “sun god” can destroy the totem. 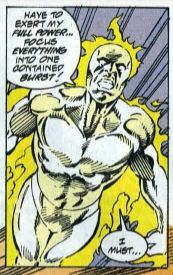 Johnny is hesitant to use his super-powerful nova flame, remembering that the last time he used it he nearly destroyed Empire State University. He overcomes his fear and goes nova, destroying the totem. This transforms Raptor back into Professor Janson. Johnny and Bridget embrace, all with him wondering who that blonde was. Fade out: Sue finds a classic FF uniform inside her guest room at Castle Doom, and she tells a Doombot to “burn it.” Did that uniform belong to Dr. Doom or to Nathaniel? And which is creepier? Clobberin’ time: Other than his scars being unusually sensitive, Ben has shown little anger over his already monstrous face being scarred. Never underestimate the power of a profitable guest star, I guess. Flame on: I’m not sure if this issue means Johnny and Bridget O’Neil are a couple now, but I like her in this issue. She keeps her head and helps out during the crisis, making her solid “superhero love interest” material. Fantastic fifth wheel: She-Hulk jokes (or not?) that she dislikes being called “Greenskin,” saying that nickname is reserved for her more famous cousin. The Alicia problem: The dinosaur Lyja transforms into is a “Gammara tortoise” and it not surprisingly looks like giant movie turtle Gamera. 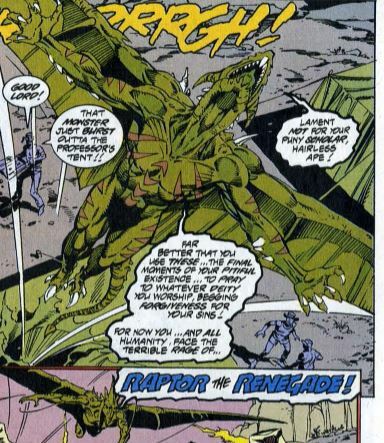 Trivia time: This is the one and only appearance of Raptor the Renegade. The comic hints at Professor Janson being his civilian identity for future stories, but it never happened. There are, however, five other characters named “Raptor” in the Marvel Universe. 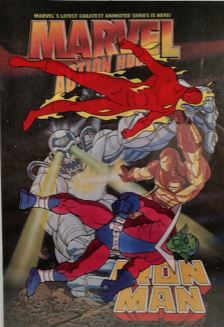 One is a lizard-man who fought Spider-Man and Moon Knight, one is a guy in a high-tech bird suit who also fought Moon Knight, one is a half-human half-bird who helped the West Coast Avengers fight Ultron, one is a Hulk-like green-skinned cyborg who fought Death’s Head, and the fifth is a Hawkgirl-style flying thief who eventually became a hero in the “MC2” alternate future. You might think that Stalking Fox is Wyatt’s grandfather, seen back in the Lee/Kirby days, but no. Wyatt’s grandfather was Silent Fox, who died back in issue #269. That story arc ended with Wyatt choosing to travel the world rather than taking his grandfather’s place, so I guess we can assume that this Stalking Fox guy is now chief in Wyatt’s place. 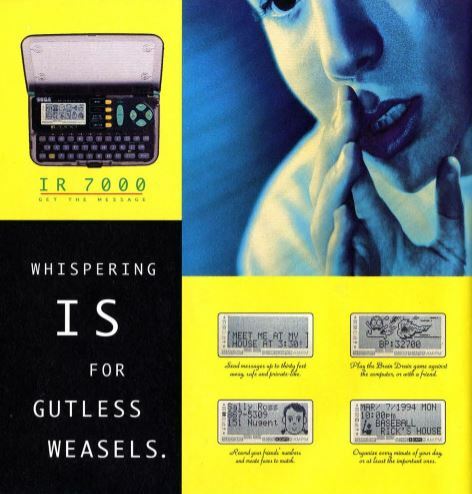 Fantastic or frightful? Enjoyable but forgettable, I suppose. A generic plot and a generic villain, but at least it’s a story with structure and a beginning, middle and end, as opposed to the soup of subplots that the comic has been for most of this era.